I made this piece for "Rompe Puesto": a one-night, celebratory performance event for which 23 artists were invited to create piñatas and filled with contents of their choosing. My piñata was a functioning disco ball (mounted on a motor with lights) that we took down and broke at the end of the night. It was filled with: condoms, pregnancy tests, Advil, mini liquor bottles, coffee, Shout wipes, Bounty and Charmin To-Go, moist towelettes, Alka Seltzer... and, of course, confetti. It was intended to symbolize what happens when you shatter the illusion of the party. Afterward, someone that attended the event said to me: "I didn’t even know that it was a piñata. 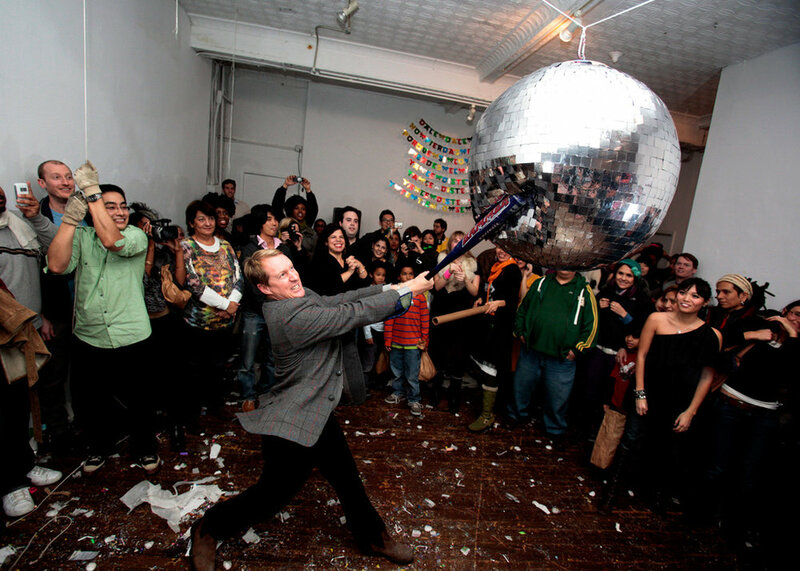 It just felt like we had already broken all the piñatas, so why not take down the disco ball and break it too?"